This journal publishes hard-hitting, peer-reviewed articles by academics, policy-makers and professionals working in commerce, and provides a lively forum for debate over solutions and analysis of critical business problems. 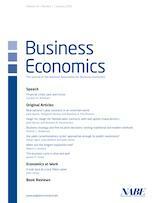 As the official journal of the National Association for Business Economics (NABE), Business Economics offers best-practice models, tools and hands-on techniques from business professionals; insights into how economic professionals apply economics in business, and respond to challenges in the workplace; and useful representation and interpretation of current economic information and issues. Business Economics stands as a leading forum for discussion and debate on problems of critical import to business as well as for analysis of key business issues. Moreover, it represents and interprets current economic topics in a manner that is both educational and useful on the job. Besides regular articles, the journal regularly publishes these feature sections: Focus on Statistics; Focus on Industries and Markets; Economics at Work; and Book Reviews.